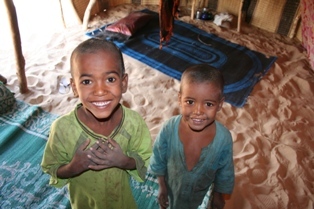 We arrived to Timbuktu by Comanav boat on the river Niger on 24th November. 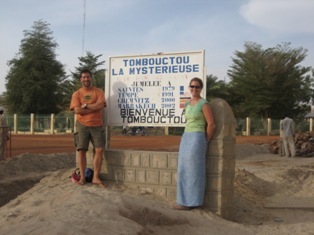 After a 6K dusty trip from the small port, we saw the sign, ‘Bienvenue à Timbouctou’ – we had made it. 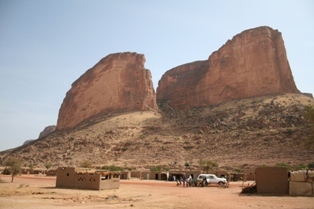 The gang decided on Hotel Bouctou, at the edge of town looking out on the Fulani Nomad camp and the desert. Once we had descended from the jeep we were bombarded by the local guides. The heaviest attack yet! Each traveller had at lest 3 or 4 around them! Most were good natured enough, but persistent to the end. We checked into the hotel and went in search of coffee. 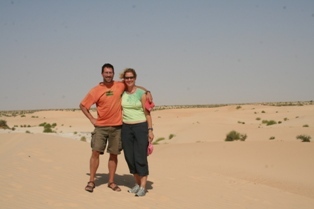 It is a very hot and dusty spot – the desert is advancing annually, and the town is slowly drowning in sand. Unlike snow, it’s here to stay! We had difficulty locating a place for some food – a patisserie sign yielded a food-free dirty room, and a shop with a coke sign outside could produce nothing better than American Cola. We eventually happened upon a cafe that had just opened a few days previously – it was like an oasis to us! Run by a French lady, it fulfilled our caffeine needs and provided a nice environment. The market place – have to bargain hard! As it was so hot, we passed the afternoon at la Caravanserai, another new and worthy spot in town, again run by a French couple. We decided that our final night in Timbuctu would in fact be spent there. 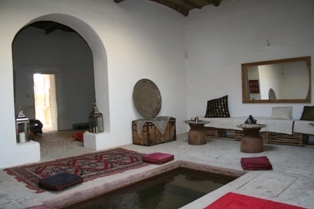 They have styled their hotel in an Arabic way – lots of cushions and candles, and a fantastic dipping pool around which to drink your evening Gin-Bissap. Bissap is a local cordial made from hibiscus plants. 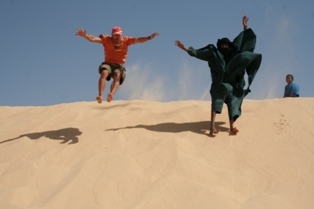 Our main trip while at Timbuctu was a camel trip into the desert to a Tuareg nomad camp. We did a deal with Ayuba, a man of many businesses. We organised to go on the trip with Lucia, our Swiss companion, and George and Roger, the two Canadians. 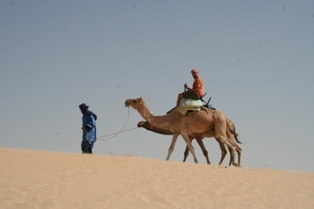 Ayuba drove us in his Renault 18 (30 years old he proudly told us) to meet our Tuareg guides and the camels. Our guides turned out to be Ishmael and his son. 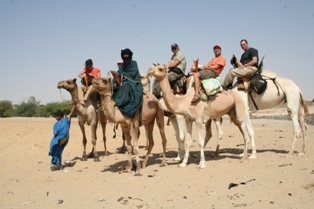 We were each assigned a camel, and once loaded up we began our hike into the desert. 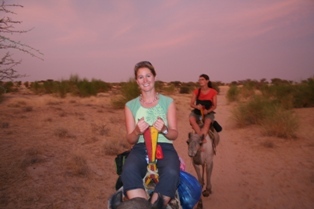 Camel riding is not the most comfortable it has to be said! 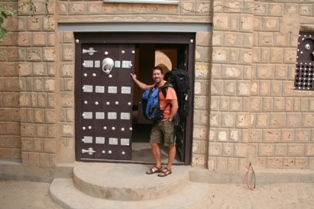 Luckily our trip to camp took just 90 minutes, so no cause for very sore behinds! Our guides were very informative and patiently answered all our questions. 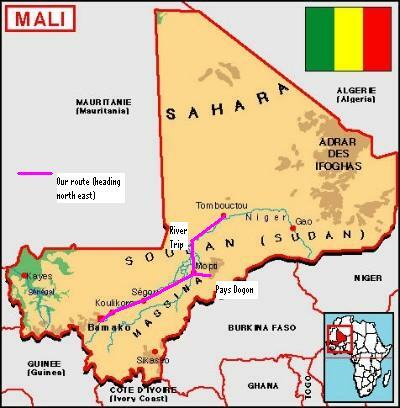 Tauregs live in all parts of the Sahara, in the countries of Mali, Niger, Libya, Algeria and Morocco. Their main trade is in salt. They take caravans of camels into the desert to the salt plains, which are located at the base of an ancient dried up lake. The return trip takes 30 days. They travel at night, and sleep by day. Once on the move they never stop. The guy in responsible for making tea has to gallop ahead and make the tea, so that when the others arrive they can drink on the move. A sort of Saharan drive thru I suppose. They navigate by the stars. Its a tough life, but they love it. So much so that they really dislike being near the town, they just come to trade their salt slabs and off they go again. It transpired that less well off families come to the Timbuctu, make some money from the tourists for a year or two, then head off again. We arrived at camp, and set ourselves up on our mats. We were entertained by local Tuaregs. They made us tea. We auickly regretted our request to have tea before dinner, as the teamaking process takes about 2 hours!! 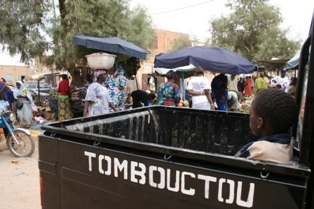 All Malians have a very precise teamaking ritual, involving lots of sugar; pouring back and forth, and time. Tea is drunk in three stages – strong like death, soft like life and sweet like love! Time is often measured in ‘teas’. Our new friends transpired to all be jewellery sellers, and after they had gained our confidence they all produced their wares. Dinner was a little disappointing – one big bowl of soggy rice, unidentifiable chunks of meat and a dodgy sauce! We all bedded down for a night under the stars as soon as the tea-making finally finished! After breakfast the next morning, we took a walk to meet our guide’s famil. 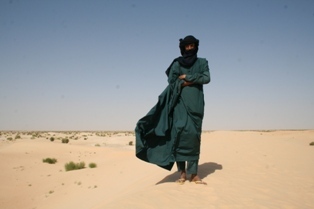 Tuareg men take one wife and by Malian standards they are quite advanced in their attitudes towards family life. Jane was trailed for the trip by the most persistent of the jewellery sellers, he was always just in my sight. She held fast and ended up with a great bargain – but only after Cathal had a word to play the game properly and not give in! There then followed a lengthy wait for the camels, African style. Watches are not de riguer in the desert. We asked our guide if he knew the correct time. He looked at the sun, and gave an answer correct to the quarter hour. We were all suitably impressed until we remembered that they all have mobile phones! 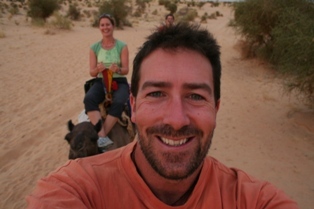 Once our trusty steeds arrived, we took a trip to some impressive sand dunes, which really were the ‘real’ desert. The Group – Lucia, me, Ishmael, George, Cathal and Roger. The main aim of the rest of the day was to sort out our return journey. 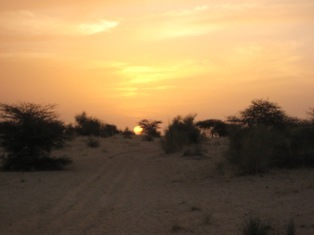 Timbuctu has no servicable road access to speak of – the trip back to Mopti involves up to 12 hours bumping over a desert track in a 4×4. Choosing your car and chauffeur takes time skill and an element of luck – not all cars are showroom fresh shall we say. Also, unscrupulous middlemen pack the cars tight – 10 people or more per car! We did very well in the end and 4 of us comfortably made the journey the following day. We only spun off the road once…that was enough for Jane to quit the front seat for the haven of the restricted view from the back seat!